One of my favorite things about summer and early fall is going out to the garden and picking fresh herbs and veggies! When the garden is in full swing one of my favorite things to make is vegetable soup packing in as much as we can into one delicious pot, especially the end of summer when it starts to get cooler. Instead I decided to play off some of our favorites. 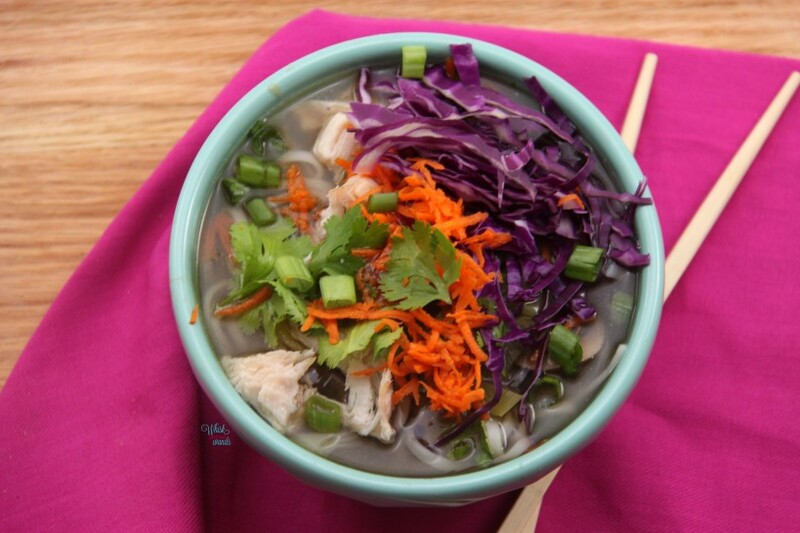 The girls love pho, ramen, noodle bowls…whatever you call them they do have their differences but they are all bowls of broth, noodles, and goodness. Not to get into the debate of the difference but keeping it simple we just go with noodle bowls. The family also loves Big Bowl, it’s one of our favorite restaurants. The best part, besides being delicious and having all.the.veggies….. we all get to have what we want. That means as many or a as few vegetables if we want, the one who loves broccoli can get a huge bowl of it with just a few other veggies and I can have all of them packed to the top! 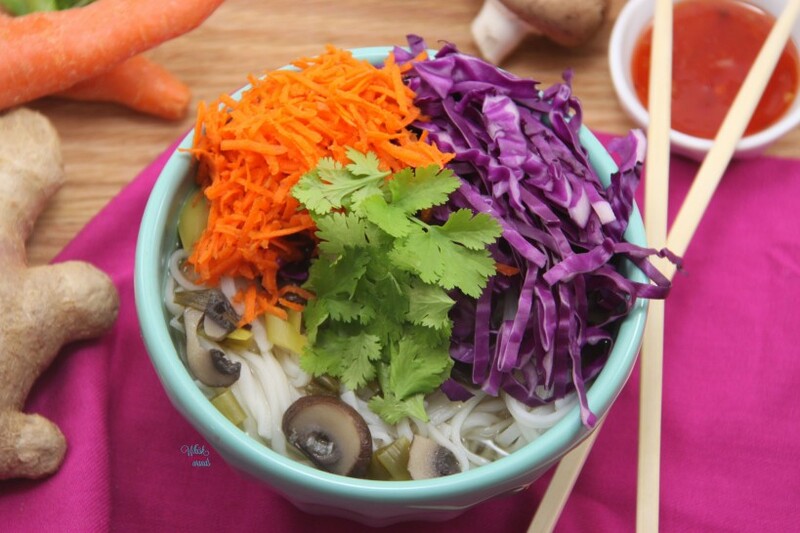 So these garden noodle bowls are a spin on that. 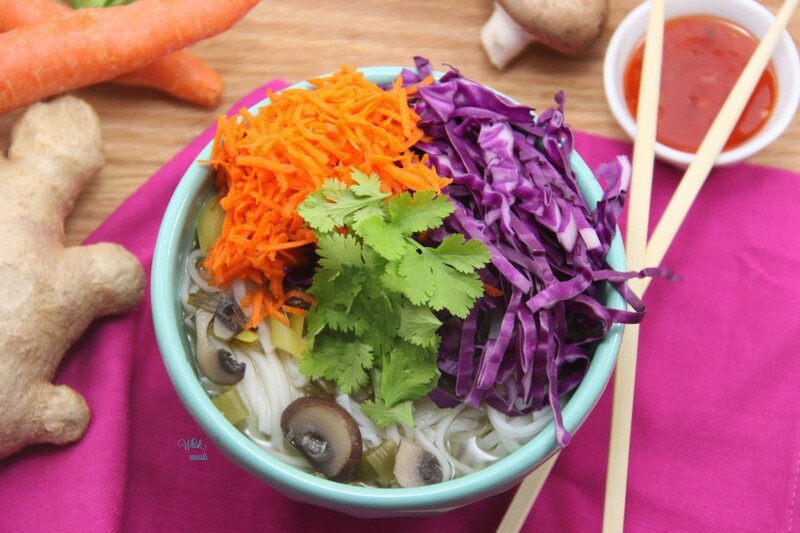 You make the broth and cook the noodles and everyone gets to add their own veggie (and protein optional) toppings! For this noodle bowl I made a simple broth with ginger, leeks, green onions, and garlic. We switch it up with what we have on hand and what we are feeling. This year the lemongrass in the garden is doing really well so sometimes I throw that in. For the fresh vegetables again I kept it simple and used what we had on hand chopping up some red cabbage, shredded some carrots, chopped green onions, and lots of fresh cilantro. Protein being optional and I’m still avoiding soy so instead of doing a big batch with protein in it I grabbed chicken for those in the family who wanted to add it to theirs. These bowls can be thrown together in 30 minutes, while the broth is simmering and they are a great way to not only use up the produce you have on hand but leftovers or the last of the veggies and or protein you have in the fridge to use up. *You can use any toppings of choice these are just the toppings shown. I also like to serve with a side of sweet Thai chili sauce. In a stock pot combine broth, ginger, leek, green onion, and sliced mushrooms. Grate in garlic and bring mixture to a boil. Reduce heat, cover, and simmer for 20 minutes (or up to an hour). 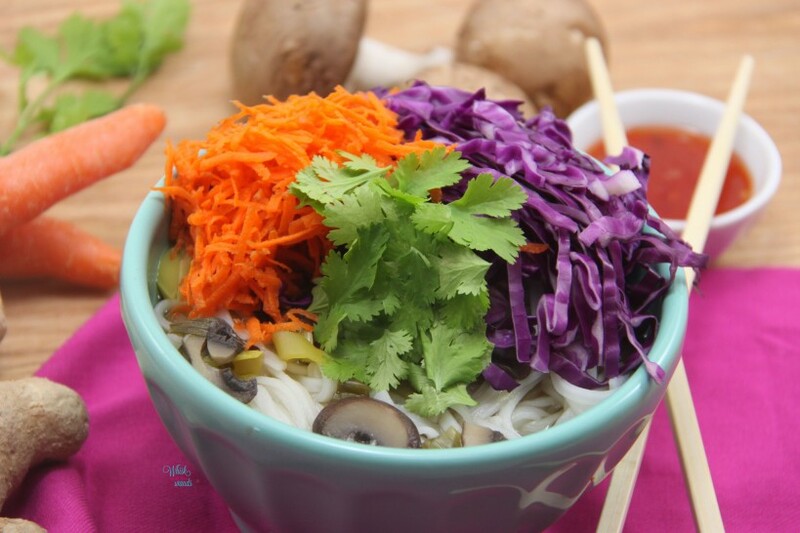 Bring a pot of water to boil for the noodles and prepare veggie toppings and optional protein. When water comes to a boil cook noodles per package instructions. When noodles are done place noodles in bowls. Remove ginger chunk from the broth and top noodles with broth mixture. 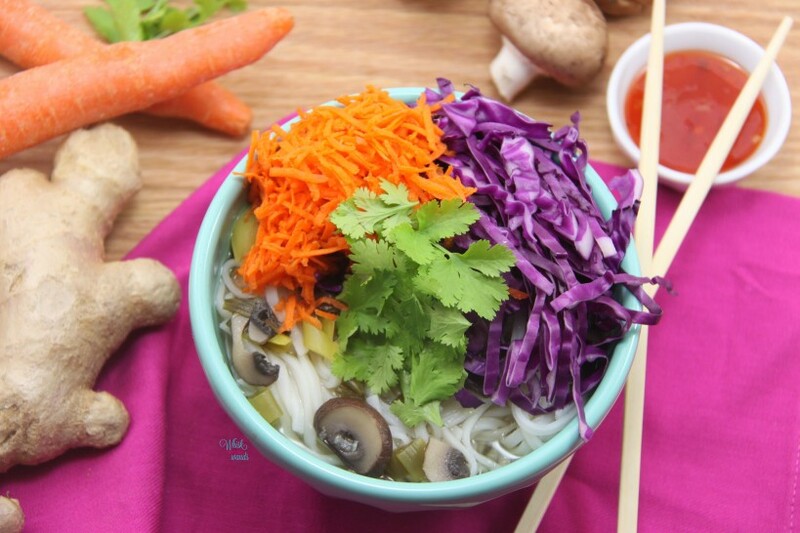 Top your bowl as desired with veggies and optional protein. Sprinkle with fresh cilantro. Enjoy! oh yum! I love noodle bowls! I have a hard time find ones with veggie broth. I love to squirt a little siracha in there too! Oh I have to try that Sriracha next time!! Homegrown lemongrass!! O I’m so jealous! This is a bowl of YUM! I have so much lemongrass… come and get it!! Oh great idea! Seriously the lemongrass overtook most of my herb garden it got so big, come and take some of it! vivarais@restaurant-le-vivarais recently posted…How To Make The Easiest Sandwich? Thank you! I have never met someone allergic to green onions, I bet there are other things you can find for garnish and added flavor!